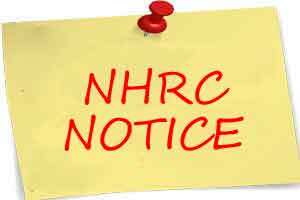 New Delhi: The National Human Rights Commission has taken suo motu cognizance of a media report that the Central Government has removed a custom duty waiver and also imposed excise duty on certain life saving drugs making them costlier for the patients. The Commission has observed that at a time when the healthcare system in the country as a whole is plagued with various ills and any action that pushes up the cost of medicines is bound to adversely affect people’s right to healthcare. Accordingly, it has issued notices to the Secretaries, Union Ministries of Finance and Health & Family Welfare calling for reports within four weeks. According to the media report, carried on the 8th February, 2016, the medicines on which excise duty will now be imposed include the ones used for treating kidney stones, chemotherapy and radiotherapy, life-threatening heart rhythm disorders, Parkinson’s disease, bone disease, antibiotic to treat infections, leukemia, allergies, arthritis and lupus. In total the Government withdrew the concession on custom duty of 76 key drugs claiming that it is necessary ‘in public interest’. 47 of these medicines are part of National List of Essential Medicines.